España El Vito… Matthew Fagan, left, and Nicholas Young. 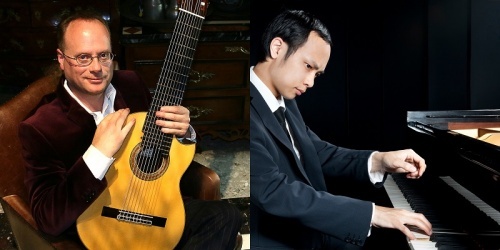 CLASSICAL guitar and piano combined don’t really work as a duo because of the difference in the volume of the two, even when the guitar is amplified, but the quality of the playing of these two musicians mostly overrode that issue in this concert at Wesley Music Centre. Beginning with the fiery “Sevilla” by Albeniz, the piano sounded out over the 10-string guitar for the first few minutes, when the solo guitar came in the audience could hear the masterly playing of Matthew Fagan. Fagan’s career and his ability put him up there with the best performers alive. Nicholas Young on piano, who we found out is also a guitarist, seems to have an equal level of musicianship as Fagan. They combined to create many amazing moments in this concert. The 10-string guitar is a younger cousin of the oud and the lute, but it was conceived in 1963 by virtuoso classical Spanish guitarist Narciso Yepes. But it has to be said that the amplification of the guitars Fagan used became too much after a while. Some music was arranged by Fagan and Young for their setting of piano and guitar, which added greater interest into many of these popular pieces. But, there was too much talk from the performers between each piece. Plus the thumping and over-loud sound coming from the amplified guitar didn’t add to the quality of the concert. That said, this reviewer found the class of playing better than almost any other performance he has heard. “El Vito” by José de Azpiazu is a short intense piece made even fierier by Fagan’s magical flair and brilliance on his instrument. It’s as though he has more than 10 fingers and can play anywhere on the guitar and make it sound astounding. Albeniz’s “Evocacion” and “Triana” from his suite for piano that took him four years to write is music that combines the sound of Debussy and Liszt with his native Spanish flair and refinement. It was played by Young from memory with a close understanding of the music. While at times it sounded too much like Debussy, the sensitive playing washed all that away. Several pieces of Manuel de Falla followed, his “Dance of the Miller” and the “Ritual fire dance” from his ballet “El amor brujo”. After the interval “Frevo Rasgado” by Brazilian composer Egberto Gismonti. Then more Albeniz, his famous “Asturias” was one and a Tango from “Espana”. Then Rodrigo’s “Concerto de Aranjuez” arranged by Fagan. This had outstanding moments but unfortunately lost its intimacy due to the over-amplified guitar. Finishing off with “Malaguena” by Cuban composer Ernesto Lecuona, which as Young said fitted an overblown Hollywood style. The capacity audience gave a standing ovation and deservedly so. After a passionate and quick encore, this reviewer longed to hear the unamplified intimacy of Fagan’s magic on this complex and fascinating instrument.